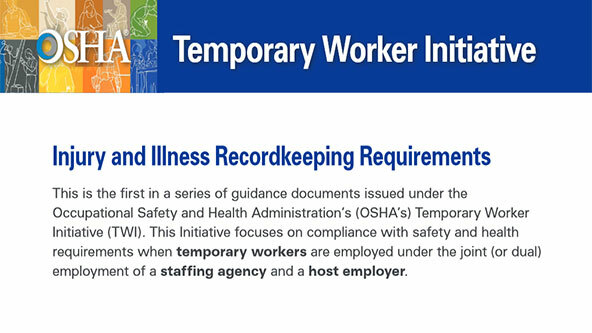 OSHA issued guidance this week on recording injury and illness information for temporary workers. It covers a question many facilities have about who exactly is responsible for recording temp worker information on the OSHA 300 Log. OSHA says the initiative is a result of activity in recent months where it "has received and investigated many reports of temporary workers suffering serious or fatal injuries, many of which occur within their first week on the job." In terms of protecting the temporary worker, OSHA's bulletin says both the temp agency and the host employer share responsibility for "determining the conditions of employment" and ensuring the workplace activities are in compliance with the law. Furthermore, the bulletin explains that while the temp agency may have a representative on site, that presence does not in itself equate to day-to-day supervision. The bulletin instructs staffing agencies and host companies to set up communication channels to ensure injuries and illnesses are reported, and for following up on the outcomes of cases. Additionally, temp workers need to be instructed on how to report such issues. A manufacturer of metal cans, Metal Can Co., needs machine operators for a short-term increase in production. Metal Can Co. contracts with Industrial Staffing, a staffing agency, to provide machine operators to work shifts on a temporary basis. Industrial Staffing hires ten operators with minimal knowledge of English and sends them to work onsite at Metal Can Co. The staffing agency also hires a person to act as the temporary workers’ team lead who will translate the employers’ orders and any provided training, and perform administrative duties such as time and attendance tracking. At the worksite, a supervisor from Metal Can Co. assigns each of the temporary workers to a particular machine. The supervisor also controls and checks on the employees’ work throughout their shift. On their second day, one of the temporary workers suffers a finger amputation injury from an inadequately guarded machine press. Who is responsible for recording this injury? For recordkeeping purposes, Metal Can Co. must record the injury on its injury and illness log. The key fact in this scenario is that Metal Can Co. supervises and controls the day-to-day work of the temporary employees at its facility. The team leader provided by the staffing agency is not empowered to modify or override the host employer’s directions and therefore is not considered a supervisor under OSHA’s recordkeeping regulation. While Metal Can Co. should inform the staffing agency of the injury, the staffing agency should not record it on its own log because the injury should only be recorded on one set of injury and illness logs. Should Metal Can Co. refuse or ignore its duty to record, the company may be subject to an OSHA citation.